Today is a perfect day for all Christians to reflect on the meaning of the cross of Jesus Christ. The Exaltation of the Cross is a quintessential feast day for Benedictines because Saint Benedict and the Benedictine charism through the centuries have dedicated themselves to the mystery of the Cross: salvation, new life, a deep reliance on mercy, rejection of Satan’s empty promises and true liberation (greater freedom in Christ). Mercy, Saint Benedict would hold, you can’t claim to be Christian. No mercy for self and others, there’s no way to be an integrated Christian. The cross recovers our fallen humanity in a profound way way. The cross is only about mercy, it is love taken to the supreme degree; the cross is not an ideological factor nor is it a piece of jewelry. Perhaps Saint Paul gets to the point for us: “For the message of the cross is foolishness to those who are perishing, but to us who are being saved it is the power of God” (1 Cor 1:18). The power spoken of here is weakness in look; strength for the heart. Many people, myself included on some days, find it difficult to intellectually accept the cross of Jesus as anything but a failure devoid of anything but foolishness and empty. Christ’s crucifixion sometimes washes over us and it ought not to. Of course there has to be more than a post-modern reliance on the intellect to help us understand the cross. But who can point us in a certain path? Let me propose a past pontiff. In his 1980 encyclical Dives in Misericordia Blessed Pope John Paul II shaprens, I believe, our attention on the mystery of the cross in view of God’s walking with us in our personal history because he notes the true message of the cross is one of mercy; that is, he is a keen on our recognition of the contemporaneity of the cross seen through the eyes and experience of mercy. The Pope’s awareness of the cross dovetails nicely with the vocation of a Benedictine monk or nun, but truly for all who profess to know and follow Christ. As Saint Benedict emphasizes mercy in a real human way that leads us deeper in faith, John Paul offers a deeper level that helps us recover what is essential about Christian living. The cross of Christ on Calvary is also a witness to the strength of evil against the very Son of God, against the one who, alone among all the sons of men, was by His nature absolutely innocent and free from sin, and whose coming into the world was untainted by the disobedience of Adam and the inheritance of original sin. And here, precisely in Him, in Christ, justice is done to sin at the price of His sacrifice, of His obedience “even to death.” He who was without sin, “God made him sin for our sake.” Justice is also brought to bear upon death, which from the beginning of man’s history had been allied to sin. Death has justice done to it at the price of the death of the one who was without sin and who alone was able-by means of his own death-to inflict death upon death. 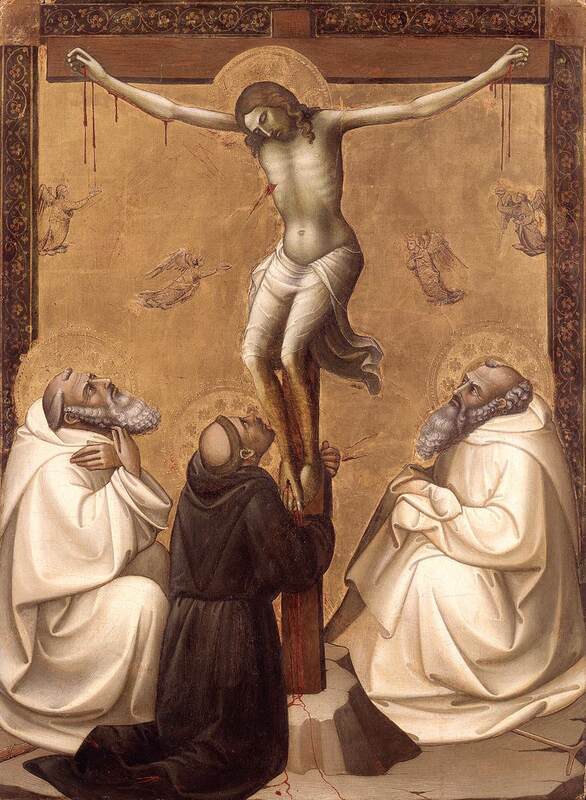 In this way the cross of Christ, on which the Son, consubstantial with the Father, renders full justice to God, is also a radical revelation of mercy, or rather of the love that goes against what constitutes the very root of evil in the history of man: against sin and death. In the eschatological fulfillment mercy will be revealed as love, while in the temporal phase, in human history, which is at the same time the history of sin and death, love must be revealed above all as mercy and must also be actualized as mercy. Christ’s messianic program, the program of mercy, becomes the program of His people, the program of the Church. At its very center there is always the cross, for it is in the cross that the revelation of merciful love attains its culmination. Until “the former things pass away,” the cross will remain the point of reference for other words too of the Revelation of John: “Behold, I stand at the door and knock; if anyone hears my voice and opens the door, I will come in and eat with him and he with me.” In a special way, God also reveals His mercy when He invites man to have “mercy” on His only Son, the crucified one.